You can order it from a local bookseller, of course; many of them can get a book within a few days at most, and are often able to work with you to find related books that might be of interest. Your business would probably be very much appreciated, and it will help to support your community and its economy. If you'd like to order the book online, it would be nice if you got it straight from Peachpit/New Riders. Why would that be nice? It means that the title generates more revenue for New Riders, since there is no middleman distributor taking a cut. This is the most direct way of voting for the importance of the topic and encouraging New Riders to devote more resources to publishing CSS-related books. It also means that the author gets more money per copy sold, but we're sure that has nothing at all to do with this recommendation. Nope, nothing at all. Note that not every online merchant is represented on ISBN.nu, so if your favorite site isn't listed, try searching there as well. That isn't a facetious question. As proud as I am of the work contained in the book, I'm also keenly aware that it is not for every reader. So let me take a moment to describe two kinds of readers: those for whom this book was written and those for whom it was not. You want a hands-on, practical guide to using CSS in real-world projects. That's exactly what this book is all about. You're a hands-on learner, someone who gets a lot more out of interactive experimenting than from just reading a book. Despite the fact that this is indeed a book, it's been intentionally designed to let the reader "play along at home," as it were. You've been meaning to increase your CSS skills for some time now, but you keep putting it off because CSS is a large, complex subject, and you don't have a roadmap for how to get to the next level. You've always wanted someone to show you how to convert a typical, old-school, pure-HTML design into a pure-CSS design and to explain why it's to your advantage to do so. If that's the case, go to Project 1, "Converting an Existing Page," without another moment's delay. If asked, you would describe your HTML skill level as "intermediate" or "expert" and your CSS skill level as "basic" or "intermediate." In other words, you understand HTML fairly well and have used enough CSS to have a basic grasp of how it's written. You've never used or even seen CSS before. Although some basic terms are defined in the text, the assumption here is that the reader knows the basics of writing CSS and is fairly proficient with HTML authoring. Some readers of Eric Meyer on CSS said they were able to use it even though they'd hardly ever touched CSS before, but this book was not written with the beginner in mind. You want to understand all of the subtleties of the theory underlying CSS and grasp the nuances of the specification. There are now many books on the market that occupy that niche. The focus here is on demonstrating effects that work. You've only done Web design in a point-and-click editing environment. This book assumes that you can edit (or have edited) HTML and CSS by hand, and its narrative is based on that assumption. Its projects may be easily reproducible in a point-and-click editor, but the book was not written with such editors in mind. 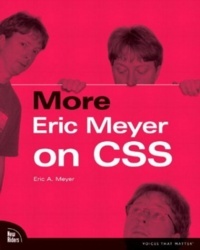 As it happens, Eric Meyer on CSS was a big hit with a lot of Dreamweaver and GoLive users, so that's a point to consider. Nevertheless, the text assumes you'll be dealing directly with the markup and styles. You want a book that will tell you how to write CSS that will look the same in all browsers on all platforms, including Netscape 4.x and Explorer 3.x. See the following section, "What You Can Expect from This Book," for details. You've read my other works and hate the personal, familiar tone I take in my writing. I promise you that my writing style has changed very little. From the outset, my intent has been to write an engaging, interactive book that focuses on practical and interesting uses of CSS that can be deployed in today's browsers. To do this, each project evolves from having no styles to being fully styled and ready for deployment on the Web. If I've done my job well, you should get the feeling of watching over my shoulder as I work on a project, with me commenting on what I'm doing as I do it. Although you can simply read the text and look at the figures to get a sense of how a project is evolving, I think the best way to work along with the book is to have a Web browser and a text editor open as you read. That way, you can follow along with the changes I make in the text by physically making the same changes in your project file and seeing the changes in your own Web browser. There is one point on which I want to be very clear: The techniques shown in this book are generally meant for browsers whose version number is greater than or equal to 5 (well, and Safari 1.0+). If you have to design a site that looks the same in Explorer 4.x and Netscape 4.x as it does in IE6.x and NS7.x, this book is probably not for you.